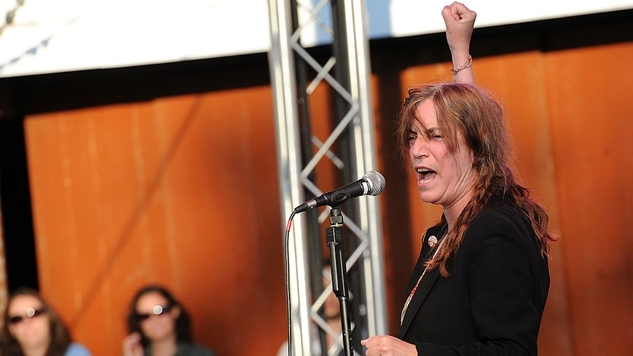 On International Women’s Day 2017, Patti Smith’s second-to-last song of the night at Northrop Auditorium in Minneapolis was “People Have The Power,” her better-than-ever 30-year-old tune-poem that plays more like a mantra and prayer than protest anthem, and which had the sold-out crowd of 2,700 this night singing the chorus out loud or with their inside voices—in the moment, the next day, and/or into the weekend. Me? I was all in on the chorus, which stuck with me as an unshakable earworm and mantra, especially as I read about the ACLU’s new “People Power” initiative over the weekend. USE YOUR VOICE. Given how quickly times are changing, I’m pretty sure every soul in the joint needed the reminder—and it wasn’t the first time Smith has been doing the reminding. For years now she’s been imploring audiences with the same edict at the end of “People Have The Power,” including recent performances at Democracy Now!’s 20th anniversary celebration, and at Smith’s 70th birthday party—both in December. She dutifully repeats it—“Don’t forget it! USE YOUR VOICE”—to the point where now it’s part of the song and a staple of the encore on stops across the globe on her current “Horses” tour. “People Have The Power” was released on Smith’s 1988 album Dream Of Life, recorded at a time when the Iron Curtain was coming down in the former Soviet Union, Reagan-Bush was waging its war on drugs and embroiled in the Iran-Contra affair, British prime minister Margaret Thatcher delivered her infamous and Brexit-foreshadowing Bruges speech, thousands of anti-government protesters were murdered in Burma/Mayanar, the Iran-Iraq War ended with a truce and over one million dead, the first student protests in Beijing over Chinese martial law that would lead to the Tiananmen Square Massacre the following year began, and the first stirrings of the people-powered World Wide Web hooked up its first two links and survived its first computer virus. “People Have The Power” is a good start. It’s Smith’s “Wasteland” and “Fight The Power” and Om Mani Padme Hum rolled into one. It may be 30 years old, but it feels like it was built for right now, and gaining steam with recent interpretations by Choir! Choir! Choir! and Neko Case, k.d. lang,and Laura Veirs, whose version was adopted by the Women’s March on Washington the day after Trump’s inauguration. To be sure, if past is prologue, then “People Have The Power” may just be getting started. It was the unofficial theme song of the Bernie Sanders revolution, as Sanders’ campaign was the only presidential campaign to similarly embrace the people’s progressive passion (the song was at the heart of any proper Bernie rally or mix, and inspired at least one fan tribute in “Bernie Has ThePower!”). Dozens of homemade videos use it to bring attention to everything from Selma to Standing Rock; it has been performed by Smith and others at protests of every kind, and the people have given it power via vibes, massive garage bands, and spoken word performances. Pearl Jam started covering it in 2003; Bruce Springsteen led all-star choruses through it for the “Vote For Change” tour in 2004; Jackson Browne, Brother Ali and Tom Morello lit it up for a “Get Out The Vote” rally in 2011, and U2 has used Smith’s version as entrance music for years, and brought on Eagles Of Death Metal to sing it with them at AccorHotels Arena in the days after the attacks on Paris in 2015. Over the years, Smith has performed it with orchestras, drum circles, Michael Stipe, Joan Baez, Tibetan monks, Sheryl Crow, Thom Yorke, Flea, John Cale, the Flaming Lips, U2, R.E.M., Miley Cyrus, Philip Glass, Johnny Depp, Iggy Pop, Tony Shanahan, Natalie Maines, Ben Harper, Natalie Merchant, and David Bowie to name but a few. These days it feels like it’s everywhere—a song for all time, for these times, a knowing balm for the pervasive anger and prevailing distrust, written in 1986 as Smith peeled dinner potatoes as she brainstormed with her late husband Fred “Sonic” Smith in their suburban Detroit kitchen. For our part, now all we’ve got to do as the punk-poet-priestess has been telling us for 30 years, now more than ever: People have the power. Don’t forget it. USE YOUR VOICE. Jim Walsh is a Minneapolis-based writer, columnist, songwriter, and the author of “Gold Experience: Following Prince in the ‘90s” and “Bar Yarns and Manic-Depressive Mixtapes” (University Of Minnesota Press), and “The Replacements: All Over But The Shouting: An Oral History” (Voyageur Press). Follow him on Twitter @saintfabio.